I’ve always been a sucker for strawberry shortcake – there something about sweet strawberries, luscious cream and perfectly dense sweet cake. 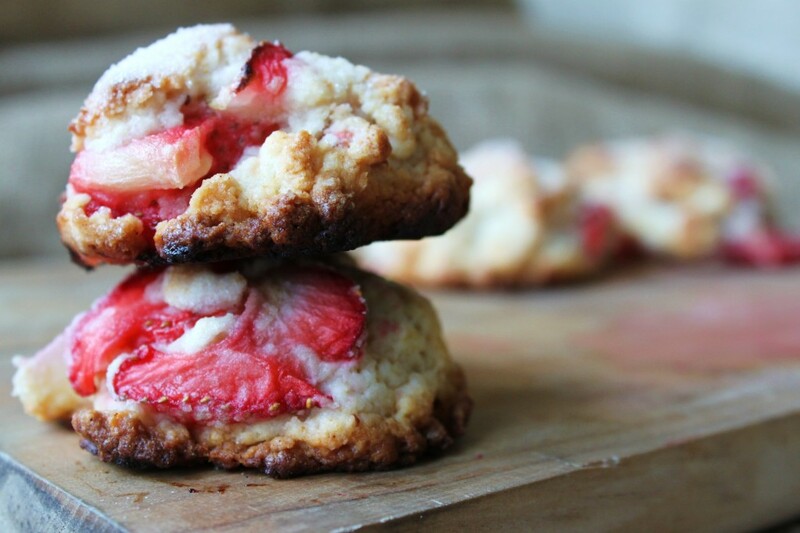 So when I came across this Martha Stewart recipe for Strawberry Shortcake cookies I knew I had to make it. As I was cutting up the strawberries for this recipe, I was thinking about the first time I ever made Strawberry Shortcake. I think I was 13 or 14, one of my cousins was visiting from New Zealand and I really wanted to show everyone that I was not just some big city California girl but that I could actually bake, like a real New Zealander. I remember it being pretty good for my first attempt – at least that’s what everyone told me. These cookies are really quite delicious. Perfectly sweet and perfectly moist. Great with a cup of tea. 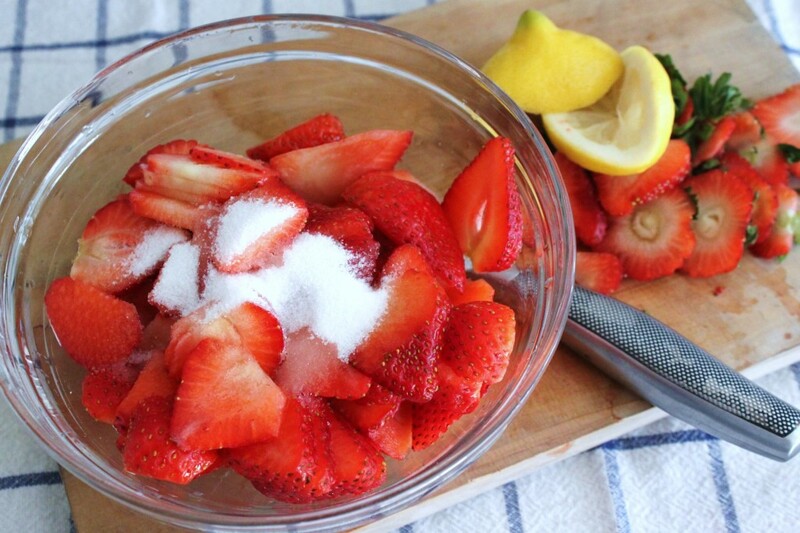 Slice up your strawberries. I did fairly large slices but you can do smaller if you want. I wanted to see the strawberry in my cookie. Next add a bit of sugar and lemon juice to get them macerating (which is just a technical term for breaking up or breaking down of food). 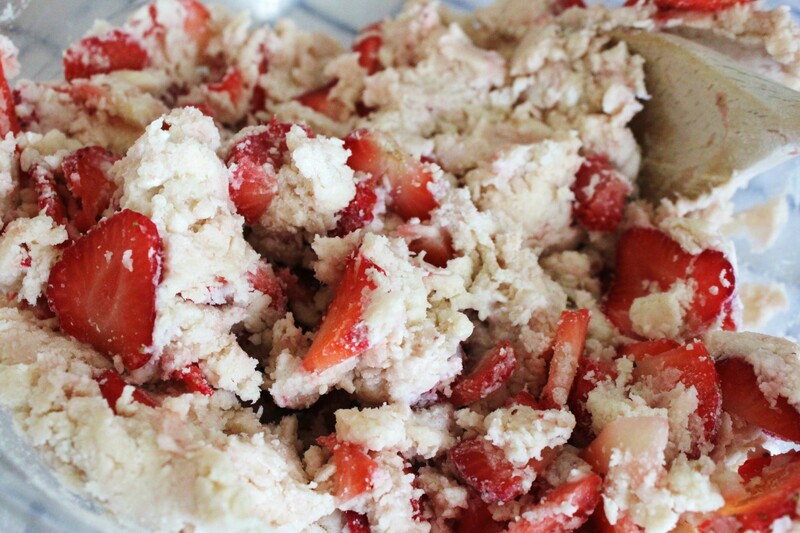 There are several key steps when making the shortcake part of the recipe. First you want to combine your cold butter into the flour mixture using a pastry cutter or you can use two knives. The consistency should resemble a coarse meal. Next up add your macerated strawberries. 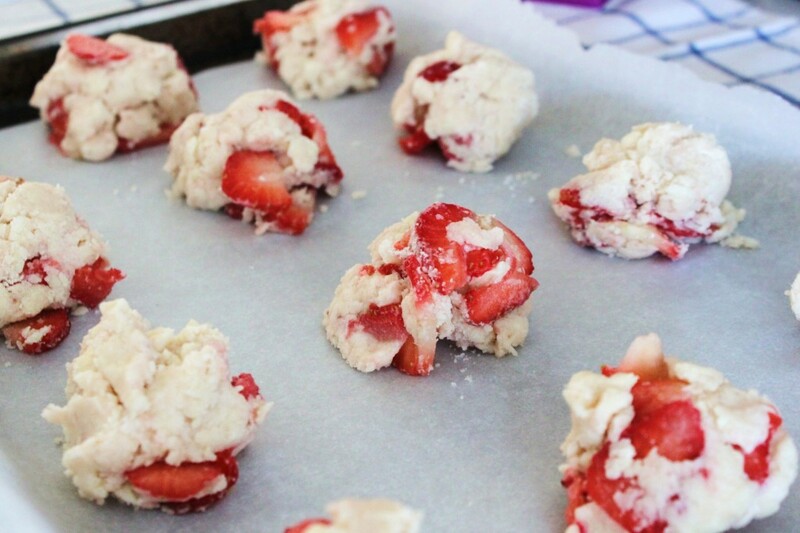 Form into balls and place on a parchment lined baking sheet. Sprinkle some caster sugar on top (I just used granulated). Look at those strawberries pop. I hope you get a chance to make these soon but beware, they disappear quite quickly. looks delicious! 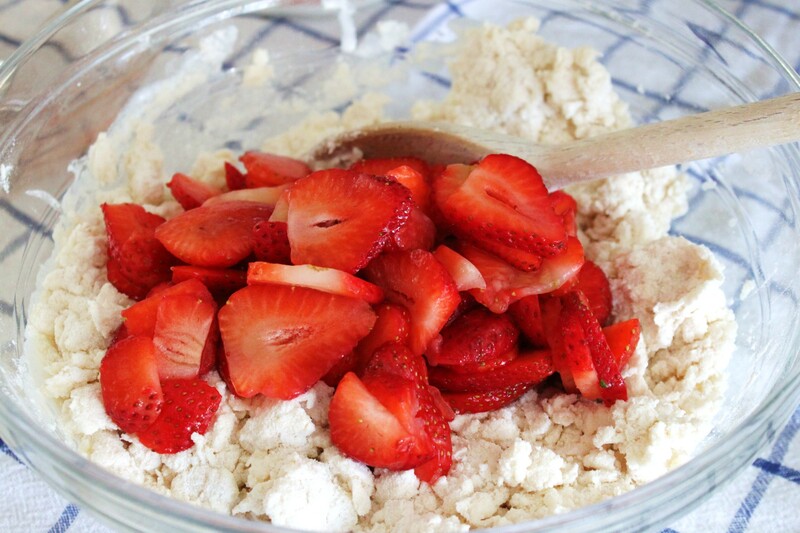 how do you keep the water from strawberries from making your batter watery? Hi Lannie – Thanks for reaching out. So, the strawberries aren’t in the sugar long enough to cause them to get too watery. I cut mine larger than what the recipe calls for so that helped. The cookies are meant to be a little moist rather than too dry. I hope you enjoy them! OMG these look so amazing, I NEED to make them soon! 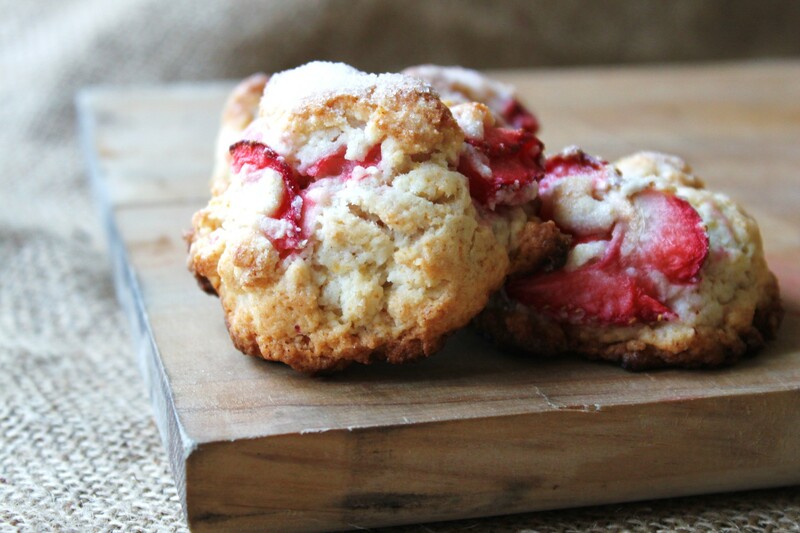 Quickie question… I have a friend who adores raspberries and she has a birthday coming up, could this recipe be adapted to use Raspberries instead of strawberries and would you be able to advise on whether any ingredient amounts need to be altered? thanks so much, happy day to you and yours. Hi Tracie – Thanks so much for reaching out. Raspberries are much more delicate than strawberries so that needs to be taken into account. To use raspberries, I would skip the sugar and lemon juice part and just fold them in as is. 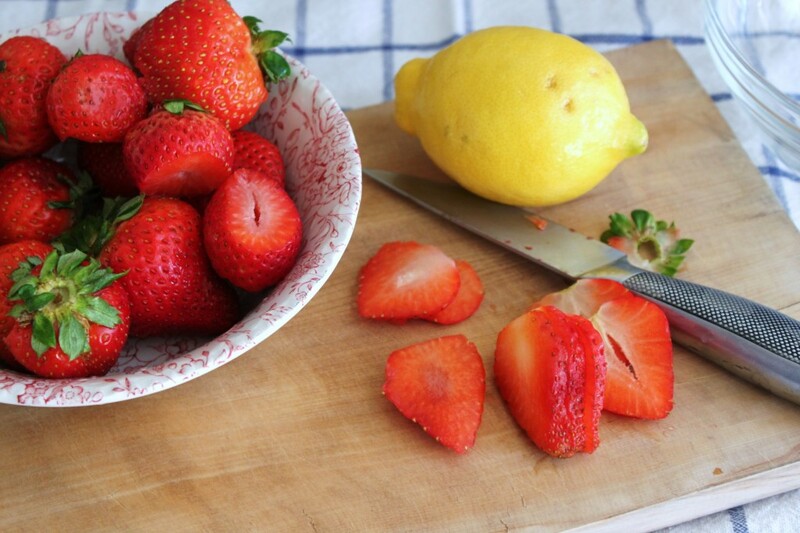 If want smaller parts of the berry, then go ahead and do the sugar and lemon but only right before you make the recipe. When folding them in, I would try and be a gentle as possible. I think that the ingredient amounts should remain the same but I would keep an eye on the batter consistency if you decide to do the whole berries, as the macerated strawberries add a certain amount of moisture to the mix. oh my. i’ve been staring at these for three days now. i NEED to try. Hi Jess – Yes, they were a hit! Let me know how it goes. I made these last night. They are absolutely unbelievable. Huge hit. Rachel! So exciting. Glad they were great and that everyone like them! Oh, my goodness! Your food photography is gorgeous and this recipe looks delicious! Thanks Hannah! That’s really sweet of you. You should make them, they are amazing!!! How beautifull. You have introduced a Brit to ‘sanding sugar’ – I had never heard of such a thing and now, of course, I want me some! Strawberry shortcake, pastry cutters, heck, even Martha Stewart – all a bit exotic for those of us from this side of the pond – can’t wait to try them. 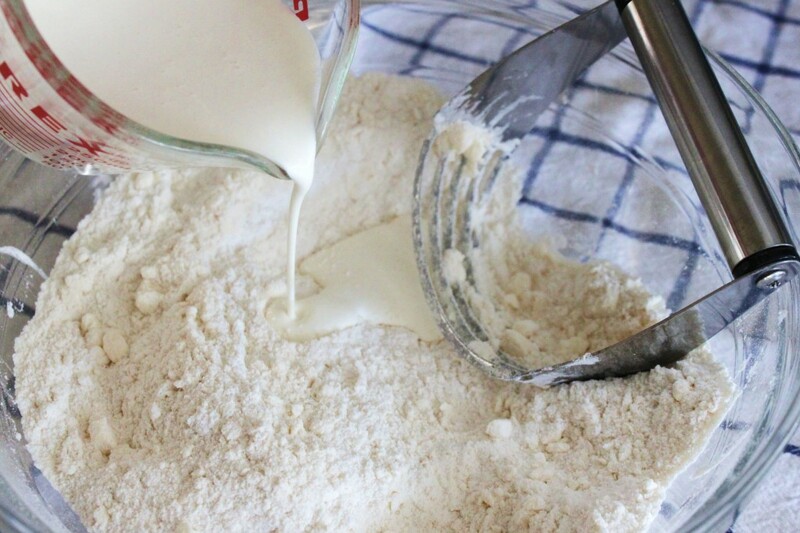 Could you make these with whole milk instead of heavy cream? Hi Chris – thanks for reaching out. So, it’s possible to use whole milk but you will just have to watch the consistency closely as milk is more watery than cream and has less milk fat – you may need less. Hi Marge – thanks for reaching out. I think that you can add whatever you want into the cookies. 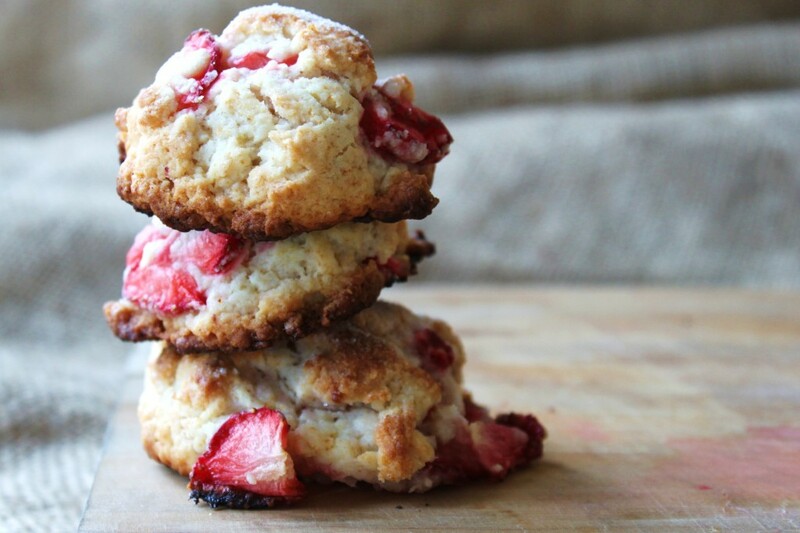 They are more moist than traditional shortcakes and can probably stand up to the nuts. Let me know how it goes!